So you have packaged your SQL monitoring and maintenance routines into a web server and demonstrated it all works from your computer. Impressed they ask for it to be put on a proper server – a Linux box. 5 years ago this would have involved using unsupported 3rd party drivers and who ran internal Linux servers anyway. Now the request seems almost reasonable although you will have to jump through more hoops than you would with Windows. With this done you can now pip install pyodbc. The pyodbc module is a wrapper around the native system drivers so you will need to install a suitable unixodbc driver. Microsoft have produced an official unixODBC driver since 2012 and it has been regularly maintained since. Installation instructions for v13 can be found on this blog post. With pyodbc and unixodbc set up all you need to change in your actual code is the driver on the ODBC connection string to ‘ODBC Driver 13 for SQL Server’ and away you go. As a quick test, the following example will establish a connection and return the servername through a SQL query. cnxnstr = "Driver=ODBC Driver 13 for SQL Server;Server=<yourserver>;Uid=<yourusername>;Pwd=<yourpassword>;database=<yourdatabase>"
Python and the Raspberry Pi go hand-in-handand if you want to learn Python from something other than sys admin and server jobs then a Raspberry Pi is good choice. Being a board only, others have also used it as the brains behind their projects. One of these Kickstarter projects that has caught my eye is the Raspi Boy – basically a screen, battery and case that looks like a GameBoy. As well as a great way to play all those games from my childhood it will also be a fully portable Python system. I have made my pledge on Kickstarter and I’ll give you a review of it when it turns up. I’ve successfully completed the 12 blog challenge I set myself (with just hours to go) even if 4 of those blogs were editorial rather than code. It has reminded me how difficult coming up with regular content is. Another problem related to content creation is how to format it. The most universal format is of course the plain text file. This has great portability and diff tools work well to see version changes but they are hardly pleasing on the eye. A universal format which allows formatting would naturally be HTML. These retain the portable advantage of text files but are far more difficult to write by hand and don’t work well with diff tools. There are of course plenty of platforms (wikis and blogging for example) that give you a near WYSIWYG (or visual) editor to hide the HTML code and cleverly store the pages so as to be able to generate a diff of versions. However this can lock you in to the platform losing the portability. One solution that tries to give portability, basic formatting and works with diff tools is Markdown. Those of you like me who grew up with email in the 90s will recognise Markdown as the way text only email was formatted. It’s main advantage is it doesn’t require any markup as such (formatting is mostly contextual) but has a direct relationship to basic HTML. With these advantages it is no wonder Markdown has found a home in version control systems which are used to dealing with text files and displaying changes between versions. If you create a readme file, sites like BitBucket and GitHub will automatically display this file along with the directory contents. Make this a readme.md (md is the common extension for a Markdown document) and this will be formatted correctly. There is a Python Markdown module with takes Markdown text and converts it to HTML. It also supports extensions to add extra functionality. With this module installed (pip install markdown) conversion is just a method call away. As a more useful example I have used this with the bottle web micro framework to create a program that allow you to view all the markdown documents in a folder through a web browser. If you go to the root it will list all the Markdown documents and you view one by clicking on it. Simply run the Python program from the directory you wish to view. Python already has a unittest module based on the Java JUnit library. You can create a series of tests by creating a class that inherits from unittest.TestCase – each method in this class then becomes a test. You can check a condition is true using the standard assert command. To run the tests just call the unittest.main method. Straight forward but this gets difficult to manage when the tests are split over multiple files. To help with this there is the nose module which can be installed with pip in the usual way. This removes the need for the boilerplate code. It will search through all the python code looking for not only classes derived from unittest.TestCase but also for any method or class that matches the regex – basically contains test at a word boundary and is in a module called test. As a simple demonstration I have created this repository. It contains stack.py – the most primitive stack implementation I could come up with. I want to ensure this works as expected so lets come up with some tests. I don’t want test code littering the main code so I’ve created a directory called test for all my testing. In here I’ve created a file called test-stack.py which contains two methods, one for testing the stack when empty and one to test that I push to the stack, I get the correct value back in the correct order. Even though I’ve not created any boilerplate code to run these tests, if I enter the following command from the main directory it will indeed find and run these two tests. Hopefully both should pass. Obviously this is a trivial example but hopefully it shows how quickly unit tests can be set up. There is a lot more to be said on testings which will have to wait for another blog post. Now as well as running the tests it will show me the amount of code the tests have executed. This is fine for a metric but if the code coverage is not 100% how do you know what the tests are missing? Add another parameter to the command, –cover-html, and coverage will create an HTML report (inside the cover sub-directory). Load index.html into a browser to see the summary similar to what is displayed on the screen at the end of the tests. Click on the module name and this shows you the module code but which lines were executed by the tests and which lines was not. A thin green bar at the start of the line of code indicates the line was executed; a red bar indicates no code execution. As a final note, coverage is just a metric on how much of you code is being tested. It does not imply anything about the quality of the tests. You can have 100% coverage with worthless tests just the same as you can have really thorough tests that only test a small section of the code. At least if you follow the above you will know what your tests are missing. A virtual environment in Python is a folder with everything needed to set up local configuration isolated from the rest of the system. This allows you can have modules installed locally which are different or do not exist in the global Python configuration. If you have used Node.js then you can think of virtual environments as npm default way of working – creating a local install of a package rather than a global one (pip’s default). If you have multiple versions of Python installed on your machine then you can also specify which version of Python the virtual environment should use. This gives you ability to test your code against multiple versions of Python just by creating multiple virtual environments. There are already plenty of good posts out there on virtual environments so the aim of this blog post is not to rehash why you should use virtual environments (see here for a good introductory blog post here) or as a quick setup guide (see the Hitchhikers Guide to Python post). It is a quick guide to using virtual environments within Visual Studio. If you have not used virtual environments before it is worth giving these posts a quick read before continuing. As an aside, Python 3.3 introduced the venv module as an alternative for creating lightweight virtual environments (although the original wrapper pyvenv has already be depreciated in Python 3.6). While this is the correct way going forward, Visual Studio uses the older virtualenv method which is what I am concentrating on here. You can change the name of the folder (defaults to env) which is also used as the name of the virtual environment and the version of Python to use. Click Create to finish and you are ready to go (easy wasn’t it). If you expand the Python Environments node you should see the virtual environment appear. In the background this has created a folder (the virtual environment) in your working directory with the name given. In case you are unsure, your working directory is the location is the location of the solution which defaults to X:\Users\me\Documents\VS20xx\Projects\Project Name\Solution Name\ – tip, change the default location). This could have been done manually by changing into the working directory and entering the following command (where X:\Python_xx is the installation directory for the version of Python you want to use and env is the name of the folder / virtual environment – if you just want your default version of Python then just pass the name of the folder). 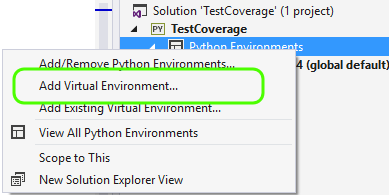 To install a module into the virtual environment from Visual Studio just right-click on the virtual environment and select Install Python Package… from the menu or if you have a requirements.txt file you can select Install from requirements.txt. If you expand the virtual environment node you will see the modules installed. Once you have all the modules installed you can generate the requirements.txt file from the same menu and it will add the requirements.txt to your project for portability. The prompt will change to the name of the virtual environment to show activation has succeeded. You can do everything you would normally do from the command line but now you are running against the virtual environment. To confirm the modules installed are only those you have specified type in ‘pip list’ and the version of Python is the one you specified with ‘python -v’. Update: It appears I’m not the only one to be looking at virtual environments today, see this article if you want a similar introduction but from the command prompt only. I started off as a programmer, who moved to support (setting up 2 service desks from scratch), then on to system administrator and then into configuration management. Now I combined all these as a DevOps engineer.